We just concluded a year of progress and are excited to share our achievements. Please take a moment to view our yearend report flipbook. 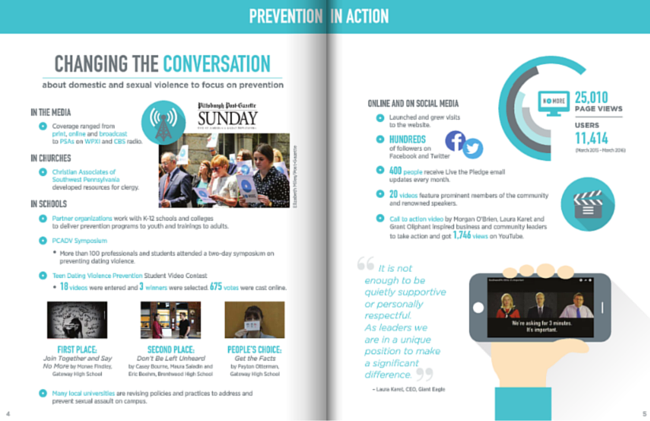 Over the past year, we have been working to fundamentally change the conversation about domestic and sexual violence and the culture in our region. We are fostering a sustained and powerful movement of individuals and organizations working on effective approaches to prevention built on a foundation of believing and supporting victims and taking these crimes seriously. Ultimately we envision healthier, more just communities where individuals and families thrive. None of this would have been possible without the dedication of those in our region who stepped up and took action. No other community in the country has shown this level of cross-sector commitment to ending domestic violence and sexual assault. We are making a difference here.